We offer a thirty (30) day inspection policy for exchanges and returns. Returned products must be received in brand new condition, meaning they are in the original packaging materials, wrapping materials, and box. Items that show marks, such as scratches, dents, etc., due to usage or misuse will not be accepted for refund. Items missing parts or accessories will not be accepted for refund. You have 30 days from receipt of your purchase in the mail to test and inspect the item. You may exchange or return the item within the 30 days. After 30 days, exchanges/returns will be accepted, but a 25% restocking fee will be deducted from the refund. Items returned after 60 days will not be accepted for exchange, return, or refunded. If your item is damaged during shipping, please report these damages to the shipping company responsible, request a damage claim number from them, and forward it to us. Please also take pictures of the damages and email them to us. We will have the shipping company pick up the damaged package. Upon receipt of the claim number from you or the shipping company, we will ship your replacement items. If you received a wrong item or items are missing from your order, please take a picture of the received item and email it to us. Upon confirmation, a prepaid shipping label will be emailed to you for the return. Once this item is return-shipped, we will immediately ship you the correct item. Please note: any claim after 30 days of receipt will be handled as a warranty issue. Contact us right away if you did not receive the correct items with your order, or if anything is missing from your order. Customized products and special orders not from our usual product line are final sale, meaning they are non-returnable and non-exchangeable. If the wrong product was sent, you must notify us within 3 days of receiving the product. If the product was received defective or damaged, Boli Optics will notify the shipper/carrier if a claim needs to be filed. If no shipping claim is required, then it is the customer's responsibility to cover the return shipment to Boli Optics. Once received, Boli Optics or the factory/manufacture will inspect the product. If the product the customer received is defective during manufacturing, the customer will be sent a replacement at no cost. Follow the instructions below to begin the exchange/return process. Returned products must be received in brand new condition, meaning they are in the original packaging materials, wrapping materials, and box. Items that show marks, such as scratches, dents, etc., due to usage or misuse will not be accepted for refund. Items missing parts or accessories will not be accepted for refund. 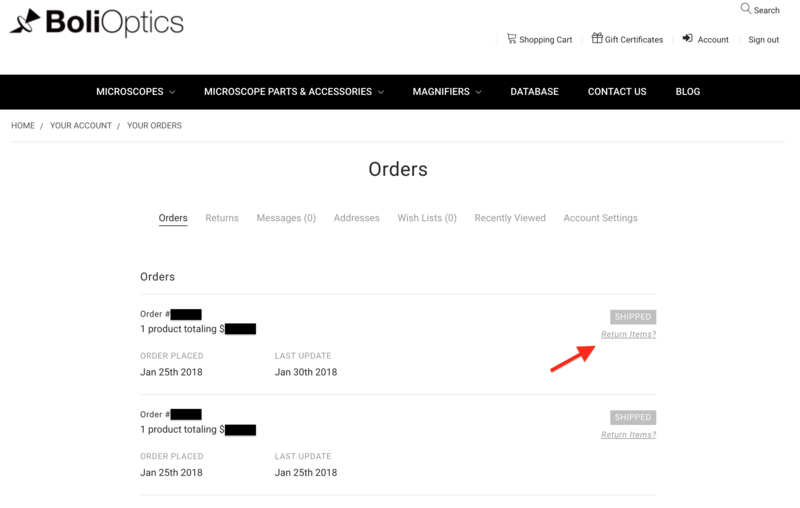 Once you are logged in to your account, go to "Orders" to see your order history. Click "Return Items?" for the item you wish to return/exchange. Please fill out the information on the next page. You will receive a confirmation email for your return request. Please mail back the item in the original wrapping materials, packaging materials, and original box. Write your Order Number on a piece of paper, and include it inside the package. To qualify for a full refund, products returned must be received back with all parts and accessories accounted for, and in the original packing material and box it was originally shipped in. Using other packaging may result in a 25% restocking fee deducted from your refund amount. If the reason for the return was that the wrong item was received or the product was damaged in transit, we will refund you the shipping. You may return most new, unopened items within 30 days of delivery for a full refund. We will pay return shipping costs if the return is a result of our error (you received an incorrect or defective item). If you contact us within 30 days for an exchange/return, we will refund your entire purchase price, less our actual original shipping and handling costs and insurance.